(New York, August 9, 2018) – Iranian authorities should immediately stop harassing and threatening the families of activists and journalists as a means to silence dissent and criticism, Human Rights Watch (HRW), the Center for Human Rights in Iran (CHRI) and Justice for Iran (JFI) said in a joint statement today. On July 27, Iranian state TV’s “20:30” program featured an interview with Mina Alinejad, the sister of Iranian activist Masih Alinejad, in which she publicly denounced her sister for her advocacy against Iran’s compulsory hijab laws. During the interview, Mina Alinejad said she was appearing on TV of her own free will, but Masih has said in an Instagram post and a New York Times op-ed on July 31 that Iranian authorities have pressured her family to denounce her on state television. “The longstanding use of Iran’s state media to force activists’ families to appear unwillingly to denounce their relatives shows the level the authorities will stoop to silence state critics,” said Sarah Leah Whitson, Middle East director at Human Rights Watch. Masih Alinejad founded the campaign “My Stealthy Freedom” in 2014, which advocates against women being forced to wear the compulsory hijab in public in Iran. The enforcement of a compulsory dress code for women in Iran violates their rights to private life, personal autonomy, and freedom of expression, as well as to freedom of religion, thought, and conscience. It is also a form of gender-based discrimination prohibited under international law. There are serious concerns that this broadcast is just the latest example of authorities using one of their well-established tactics to pressure and threaten family members of Alinejad, who is based outside Iran. In March 2018, the British Broadcasting Corporation (BBC) filed a complaint at the United Nations Human Rights Council against Iranian authorities for their campaign of harassment against BBC Persian staff. The harassment included the arrest and intimidation of employees’ family members based in Iran. “A government that preys on the bonds of family in order to lash out at its critics is a government that has no respect for the rights of its citizens – or common decency,” said Hadi Ghaemi, executive director of the Center for Human Rights in Iran. Iran’s government-run Islamic Republic of Iran Broadcasting (IRIB) has a long history of parading Iran’s critics and their family members on national TV, where they are forced to make so-called “confessions” or public statements meant to discredit them and their causes. Human rights groups have documented several instances in which dissidents, activists, and journalists were featured in pseudo-documentary videos intended to “prove” their “guilt,” though they apparently did not appear willingly. On February 13, a few days after the suspicious “suicide” in detention of prominent environmentalist Kavous Seyed Emami, IRIB’s 20:30 program claimed that he was a spy – an allegation for which his family has since filed a defamation lawsuit against IRIB. The program featured a video-recorded statement by Kavous’s brother saying that he had seen the body and believed that he had committed suicide. The family has said authorities coerced the brother into recording the video when they raided his house a few days earlier. On July 9, Iranian state television broadcasted apologies by several women, including Maedeh Hojabri, a teenager briefly detained in May for posting videos of themselves dancing on their personal Instagram accounts. In December 2015, the European Court of Justice (ECJ) rejected a complaint by two IRIB officials against the European Union’s decision to include them on its human rights sanctions list. The ECJ placed them on the list in 2013, after Press TV, an English and French channel affiliated with IRIB, broadcasted a series of forced confessions by detainees who had been tortured. The Court ruled that under their leadership, IRIB and Press TV had both repeatedly and closely collaborated with the Iranian security apparatus and Revolutionary Court prosecutors to coerce confessions from prisoners of conscience and then broadcasted them under the pretext of interviews conducted with the approval of the prisoners. 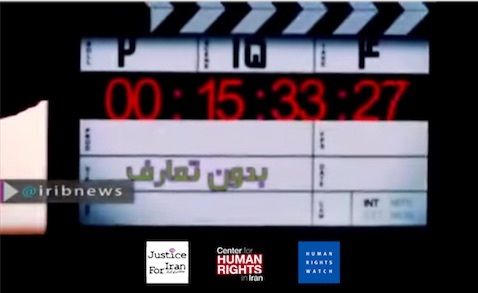 “As the European Court of Justice emphasizes in its ruling against the IRIB chiefs, collaboration with the security apparatus in producing pseudo-documentary videos, and broadcasting coercive confessions are serious human rights violations,” said Shadi Sadr, executive director of Justice for Iran.